The Gibson Gir l, popularized through drawings by Charles Dane Gibson, was the first national standard of American feminine beauty. Never before had a fashion taken the entire nation by storm. Before the late nineteenth and early twentieth centuries, standards of beauty were localized and fragmented. The Gibson Girl changed all that, particularly with the spread of media which plastered her face (and her iconic hourglass shape) across the American consciousness. 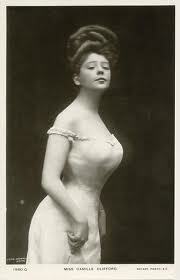 The Gibson Girl appeared in photographs and advertisements all over the nation. Her heavily accented S-shape, hair piled upon her head with a waterfall of curls around the neck and ears, and thin neck were fashioned to give her an air of ephemeral beauty. Then something happened. And that something was WWI. As young men went off to die in muddy fields, women were left behind to enter the work force. They worked in factories and businesses and gained monetary wealth and independence. When the war ended there were no more men to take up those jobs again. There were few men left, period. France,Germany, and England had been bled white. So women, who had found an independence both in the work force and socially during the war, were not forced by returning men to give up their jobs or their new found security. In fact, they pushed the boundaries. They became more outspoken and openly challenged religious and social mores. They drank and smoked in public, listened to jazz, and they were much more open and frank about their sexuality and their overt disdain for authority. They were independent and strong-willed. They really did change the fabric of the nation almost overnight. During this time Coco Chanel popularized the image known as garconne, the feminine French phrase for “boy.” It was an instant success, partly, I think, because it challenged so many ideals at once. The garconne image consisted of short hair, flat chest, short skirts, straight waists, bared limbs, all combined to give the impression of a woman who was independent and, quite frankly, everything opposite of what the Gibson Girl portrayed. Even the way she acted, moved, behaved in public, and the slang she adopted was carefully carved to present an image that challenged authority. Now what amazes me most about all this as a writer is not how fashion trends swept the nation. What with the advent of movies, advertisements on a national scale, and radio, it is not surprising certain trends took the nation by storm. What I find interesting i s how the flappers grabbed a fashion that did so many things at once. It not only emulated the men who had died in the war, it told everyone that here was a woman who herself was independent, just like men were. No longer did the Gibson Girl and her carefully sculpted and crafted statuesque figure dominate. The flapper was not caged and sculpted. The flapper was free and independent and outspoken. She was everything the Gibson Girl was not. I wonder if there has been some psychological study as to a correlation between the garconne look and the fact women suddenly found themselves in a world where most of the men had been ground into non-existence under the remorseless wheels of war. I don’t think it was a conscious decision on their part to adopt the garconne look. 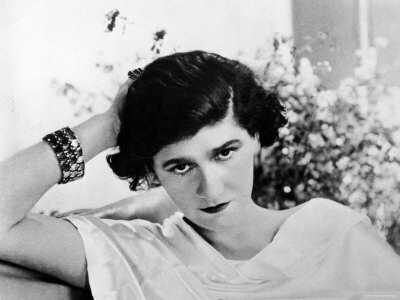 Then again, maybe it was considering it came right out of the genius of Coco Chanel. I suppose like most things in life there is more than one reason behind the entire movement. Simple explanations are fine for fiction, perhaps, but they don’t hold up in the light of historical verification and reality. Movements in culture and social ideas fascinate me as a writer. By examining in detail a certain aspect of history I think we can often better understand events that happened in the past, and prepare ourselves or work toward, more liberal interpretations of ourselves and our place in a society for the future. That is, for a future which includes everyone and is not exclusive, but inclusive. The flappers started that long struggle way back in the 1920s. It continues today. Started a new novel today, and one almost-nervous breakdown later….